To follow the noble example of their Loyal Ancestor. 1. In Whitelocke's Memorial, p. 504, it is said that the earl of Derby had got together 1500 men; Secombe, in his History of the House of Stanley, says "about 600." 2. 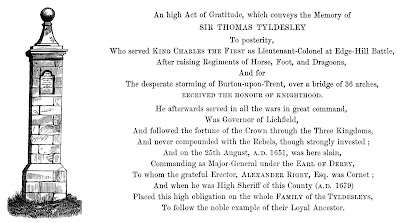 According to Whitelocke, p. 505, the earl of Derby lost on this occasion in prisoners, five colonels, the adjutant-general, four lieutenant-colonels, one major, four captains, two lieutenants, and 400 men; and had slain Lord Widdrington, Major-General Sir Thomas Tyldesley, one colonel, two majors, and divers others of quality. 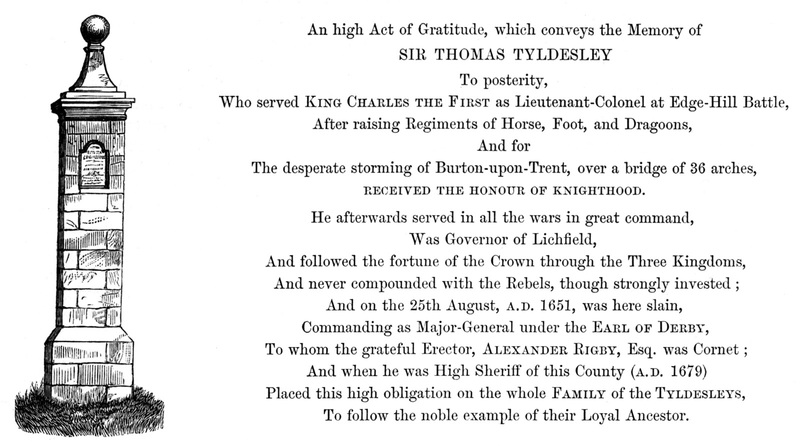 So highly did the Parliament estimate the " victory of Wigan Lane," that they voted to Colonel Lilburne £500, and £200 per annum as a mark of honour for his services, with £100 to the lieutenant who conveyed the despatches; and public thanksgivings were ordered to be offered up in the churches of London and Westminster for this victory.